Inn and Spa at Loretto is a great hotel choice in Santa Fe, New Mexico. In this historic and cultured state capital, you want a hotel with character. And Inn and Spa at Loretto delivers a deeply Santa Fe-flavored experience. This hotel has a perfect setting in Santa Fe. Inn and Spa at Loretto was built in 1975 but looks vintage. It is noted for its beautiful Southwestern-style lobby. Will Inn and Spa at Loretto Be Your Style? 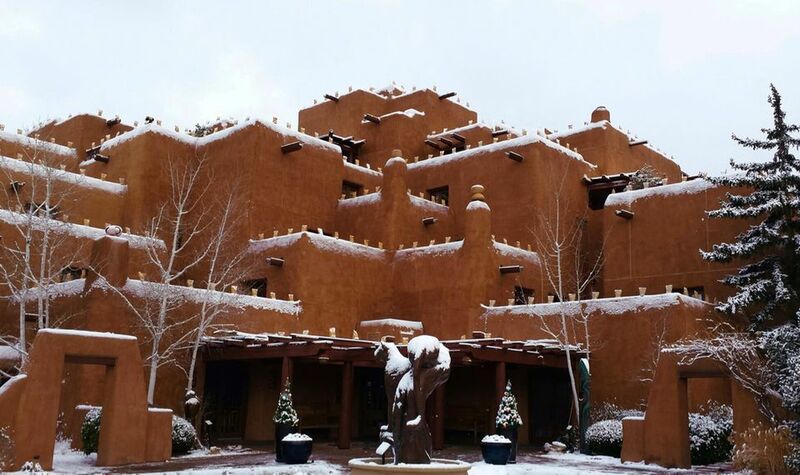 Will Inn and Spa at Loretto Be Your Perfect Santa Fe Hotel ? The property was renovated in 2015: rooms, lobby, restaurant, meeting rooms. The hotel has 136 rooms and suites spread over five floors. Rooms are decorated with definite Southwestern flair but do not overdo the Wild West look. Inn and Spa at Loretto's accommodations come in numerous categories of rooms and suites, from compact and stylishTraditional Guest Rooms to sprawling suites whose large terraces deliver stirring views of Santa Fe. Hotel guests have plenty of opportunities to relax and enjoy the property. Santa Fe, a town of 65,000, has more good restaurants than many cities 10 times its size. The Inn and Spa at Loretto houses one of the very best restaurants in this culinary capital, Luminaria. This is not just a beautiful restaurant with a dreamy patio. It is a delicious place to eat. Chef Marc is a native New Yorker who has cooked all over. His approach at Luminaria is seasonal New American food with Santa Fe accents: a style more bistro than cantina. It's the best of both worlds and perfect for an upscale dinner in Santa Fe. • In his words, "I have traveled and cooked in many different regions, and your meal will be diverse, colorful, full of flavor, and brimming with fresh ingredients from the Farmer’s Market. I intend to give you a unique Santa Fe dining experience." The hotel's elegant, comfortable lobby "Living Room" lounge is a social hub that serves drinks and top-notch New Mexican snacks. This spa is an oasis of warmth and comfort. Set in a quiet, private corner of the hotel, it feels like a hushed getaway. Santa Fe is a center of spa and well-being culture, and practitioners are top-notch here. Whatever service you undergo at The Spa at Loretto will be conducted with expertise and flair. • Treatments are dedicated to women, men, couples, athletes, etc. The Inn at Loretto is set beside one of Santa Fe's top draws for visitors, Loretto Chapel and its "miraculous staircase." The chapel, now deconsecrated, houses a remarkable object. Here's the story. The chapel was initiated by Archbishop Lamy in the late 1880s to serve as a smaller chapel to St. Francis Cathedral next door. The plans called for 20-foot-high, wooden circular staircase with no center support: just winding stairs. The design seemed impossible to pull off, and the Santa Fe construction team was at a loss. As if to answer the challenge, one day a carpenter showed up at the chapel's construction site. No one had ever met him before. The carpenter said he could build the seemingly impossible staircase. And he did. In a matter of days. And here's the miraculous part. This carpenter hand-built a graceful wooden circular staircase with no supports, and without nails nor glue. The 33 perfectly angled steps and bannisters were flawlessly fitted together with only small wooden pegs as hardware. When the carpenter finished his masterpiece, he disappeared as enigmatically as he had appeared. Who Was that Humble Carpenter? You can imagine what the devout worshipers of St Francis Cathedral believed. Some said he was St. Joseph, some dared to believe more. And the legend lives on. The chapel is no longer holy, but its power remains. Engaged couples from far and wide can hold their wedding ceremony here, with any variety of officiant. The chapel is also a tourist attraction in Santa Fe. Guests at The Inn and Spa at Loretto get a pair of free tickets. Disclosure: As is common in the travel industry, the Luxury Travel Expert was provided with a complimentary visit in order to describe the hotel. For details, see our site's Ethics Policy.